Another date night with the boyfriend (FG) has been and gone. 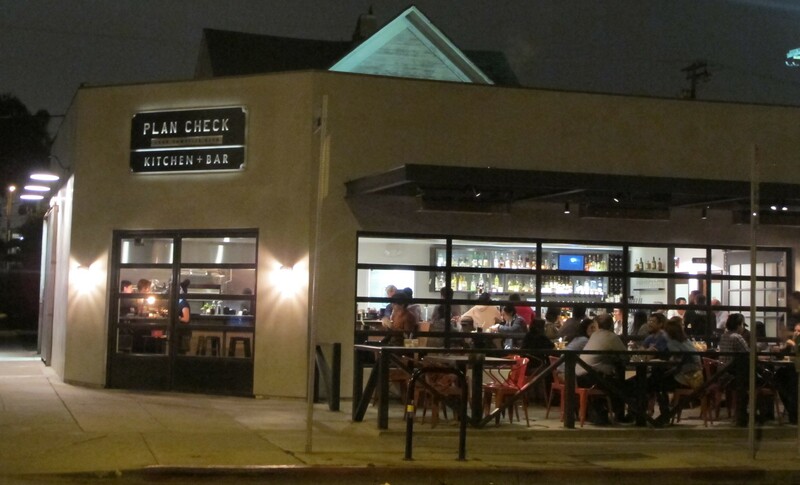 This week we decided to check out a place brand new to the foodie scene here in Los Angeles, called Plan Check which opened to the public on February 22nd 2012. I didn’t get to the opening, but here late on Monday night I was impressed with how busy it was for somewhere so new. Good news clearly travels fast. Ernesto Uchimura (originally Executive Chef of Umami Burger) is behind the menu, and Pablo Moix (whose recent successes include La Descarga and Harvard & Stone) put together an interesting drinks list. Two greats coming together was bound to be good. 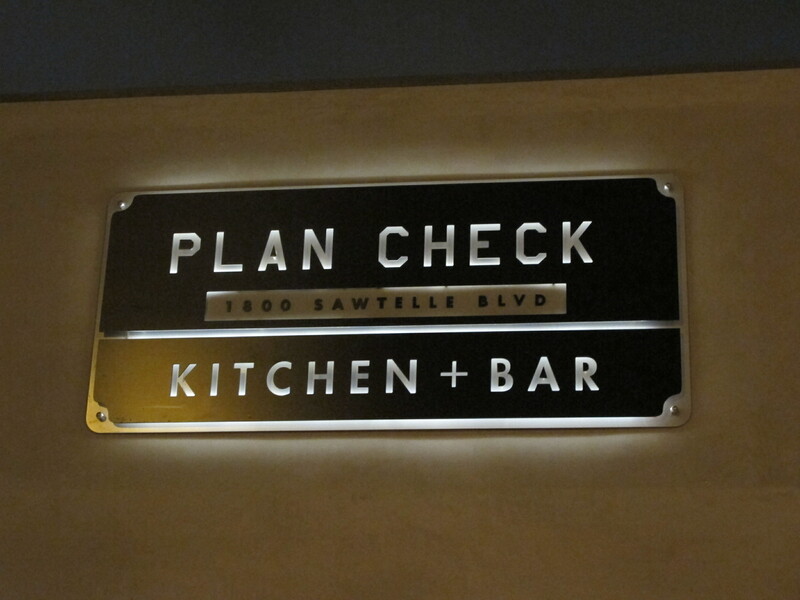 Plan Check is named because of its location beside the ‘Building and Safety Department’, (where Architects and Designers get their plans reviewed for permitting). 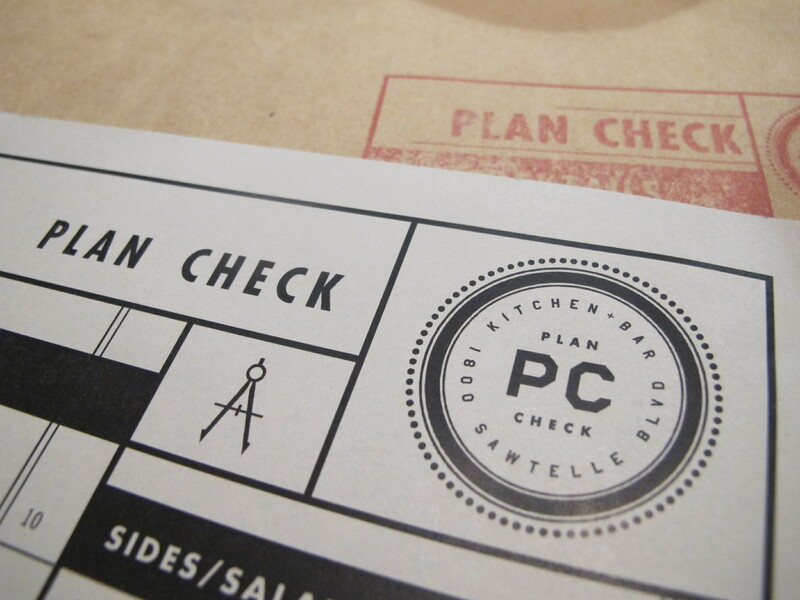 This is subtly incorporated in their design on the menu too, with a simple pair of compasses. 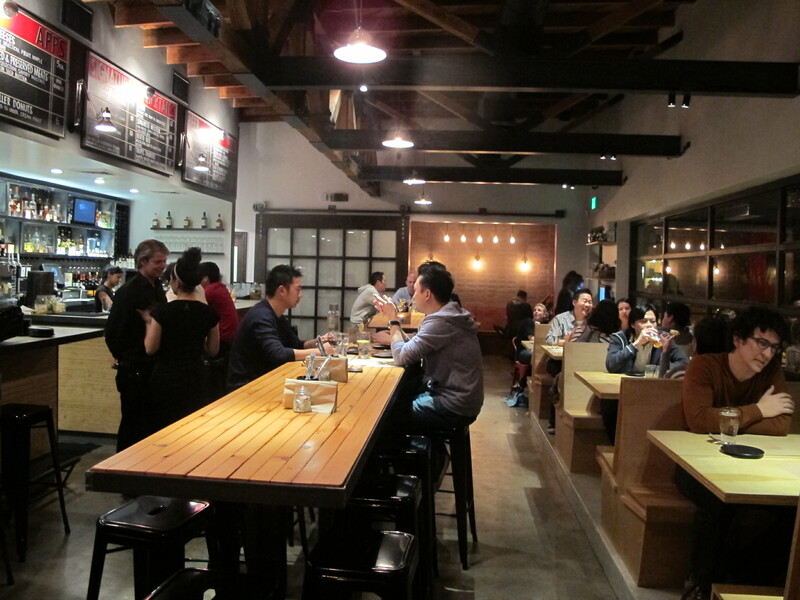 The place has a really relaxed feel to it and an open kitchen in full view as you walk in. Community style tables in the centre and booth seating around the sides make for a great place to go with a group of friends. The room itself had fairly bright lighting, which I don’t normally like, but worked well in this setting. Our bartender Rachel greeted us quickly, and got us started with some drinks. I had a ‘Little Osaka Sour’ and FG had the ‘Ronin.’ I was really impressed seeing Rachel stir the Ronin at the same time as shaking my Sour, she made it look effortless but I know it’s not as easy as she made it appear. The Little Osaka Sour was good, but really tasted to me like a Whiskey Sour (which is essentially what it is, with the addition of plum wine). The plum wine flavors were barely noticeable to me but the drink itself was tasty. FG really liked his drink, it was a straight forward Rye Cocktail sweetened with Benedictine. It could be a little too sweet for some, but the Benedictine added a layer of complexity which I liked. FG said it reminded him of a ‘Monte Carlo Cocktail’ but softer and easier to drink. We decided to order a selection of dishes and have them all come at one time so we could share everything. 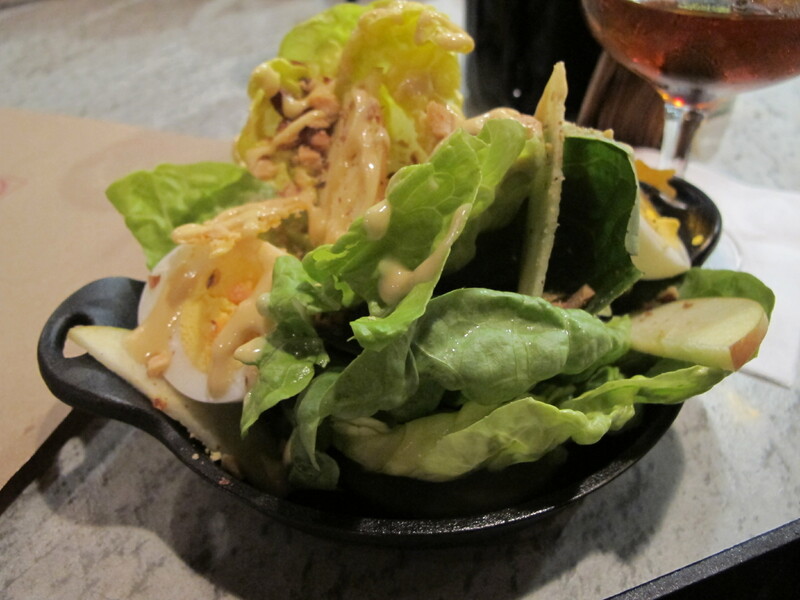 All the food was served in little black skillet style dishes which I thought were really fun and different. I knew I had to get one of the burgers (if only to see how it compared to Umami), we also ordered Short ribs, A butter lettuce salad and a stuffed portobello mushroom dish. The burger looked and tasted fantastic. Double bacon, double cheese and a fried egg was bound to be a winning combination, and I could immediately see why it was named ‘Chefs Favorite’. My burger included ‘Ketchup leather’ which is a dehydrated tomato based sauce they make in house. Doesn’t sound too appealing I know, but it was actually very delicious as well as a smart invention because it doesn’t ooze out the sides of the burger or make the bread soggy like regular ketchup. I made one modification to the dish by choosing not to add hot sauce, purely because i’m not a fan of spicy. The egg had a perfectly runny yolk, the bacon was crispy, the meat was juicy and there was a salty sweetness from the Ketchup leather. It hit all the right notes and I highly recommend it. I enjoyed the burger so much that I had a hard time giving my boyfriend his share! The salad was the only item we ordered that we didn’t finish, I didn’t like it at all and found the dressing too spicy for my tastes. FG just found it physically difficult to eat in the skillet pan with pieces of egg and almonds flakes falling to the bottom of the dish. I really wanted to like it, but sadly it didn’t impress. The Stuffed mushroom surprised me the most because I didn’t expect to enjoy it so much. I don’t generally eat mushrooms, I like the flavor but not the texture (i’m fussy remember!) 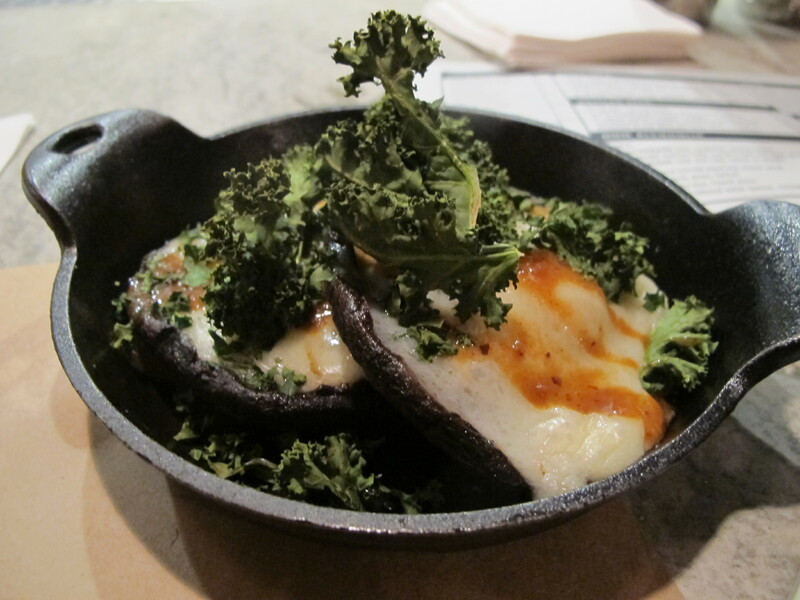 but the Portobello was almost meaty in consistency and the cheese melted over the top made for a deliciously rich fondue sauce. The crunchy dried kale was a fine addition to the dish, and tasted very similar to seaweed. I was impressed so see a drink using Almond milk, which is a great option for people who are lactose intolerant. 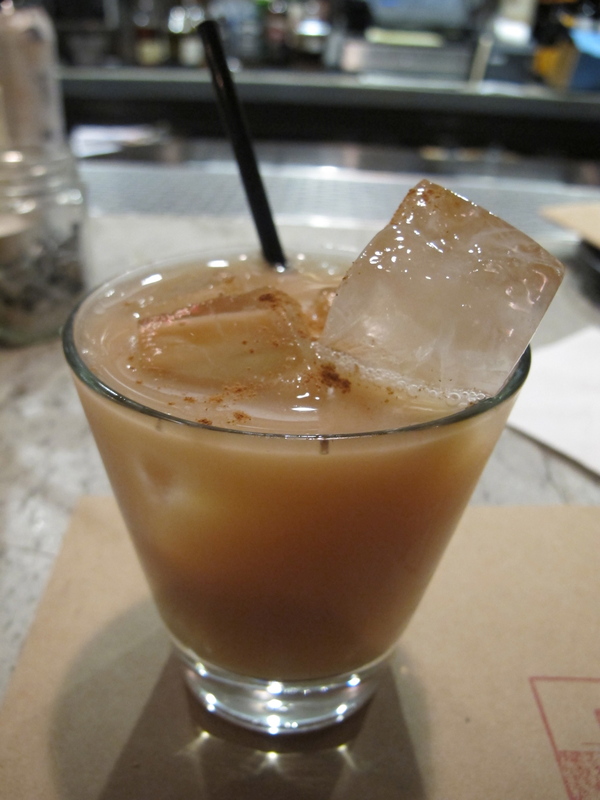 It tasted like Horchata, (a drink from Latin America that has Vanilla, Cinnamon, Almond flavors) and the all spice dram gave it a cloves ‘Christmas-like’ finish. It went perfectly with the donuts we ordered. The donuts were made to order and looked like circular Churros, they had a crispy coating, soft insides and a salty sweetness to them with just a touch of cinnamon sugar that complimented all the flavors. They were served on a layer of Crème fraîche with banana slices. Delicious. I wanted to try one so bad, but our stomachs just wouldn’t allow for even one more bite! I will definitely make sure to try them on the next visit though. I am giving the drinks 3.5 out of 5 Coupes. The drinks list was interesting and the ones Rachel made were all executed correctly, balanced and flavorful. I found them to be very good but not excellent. Nothing blew me away, so to speak, which is surprising as I usually go crazy over Pablo Moix creations. I will happily return to try others on the list though. I am giving the food 4 out of 5 Platters. The prices were more than reasonable and all the dishes we tried (besides the salad) were great, however the burger was nothing short of excellent. I liked that they make their own sauces in house and the ketchup leather is an unusual but tasty invention. Service was fast, friendly and the options to choose from were all interesting. Overall we had a nice evening and I will happily return in the coming months. I encourage anyone who lives near to “check out” Plan Check for yourself, and if you’re a meat eater, definitely give one of their burgers a try.